Spring brings us big, beautiful artichokes which I love to stuff and serve as a first course or entree. Here are two of my favorite versions. Italian Sausage Stuffed Artichokes and Anchovy & Pine Nut Stuffed Artichokes. Italian Sausage Stuffed Artichokes ~ Serves 6 ~ This is a meal! Add a salad using bitter greens like arugula with good red wine vinegar and extra virgin olive oil. Rinse the artichokes. Slice about ¾-inch to an inch off the tip of the artichoke using a serrated knife. Next, cut off the tips of the petals using scissors and remove the small petals at the base. Last, cut off the stem so that the artichoke can sit flat. Reserve the stem. Rub the artichoke with the cut lemon. Steam the artichokes. If desired, add a few aromatic bay leaves, sliced garlic, sprigs of thyme, etc. to the water before steaming the artichokes. For this recipe, steam until almost done but not quite tender, between 20 and 35 minutes depending on the size. Use a sharp knife to pierce through the bottom of the heart to check for doneness. Evenly spread the breadcrumbs on flat baking pan or cookie sheet and bake until toasted but not completely dry, 5 to 8 minutes. In other words, don’t be too picky but do watch them closely so they don’t burn. In a sauté pan over medium heat, sauté the pork, breaking it into small pieces, until it is cooked through and crumbled. Drain on paper towel. Add two tablespoons olive oil to the pan and then the onion and garlic sautéing until the onion is tender. Add the onions and garlic to a medium bowl along with the sausage, bread crumbs, herbs, pine nuts and cheese and toss just to blend. Season to taste with salt and pepper. Once the artichokes are cool enough to handle, gently spread the leaves to open the artichoke giving room to add the filling. Remove the smallest leaves in the very center. Using a teaspoon, scrape out the fuzzy choke making sure you get the fuzz out of the crevices. Lightly fill the artichoke center with filling as well as in-between the leaves and place the artichokes in a baking dish that has just enough room to hold them snuggly. Drizzle with remaining two tablespoons of olive oil and the one cup of broth. Carefully pour water into the bottom of the dish (avoiding artichokes) up to ¼-inch. Bake for 30 to 40 minutes or until the top of the stuffing is lightly browned and the artichokes are hot. Serve the marinara sauce as a dip on the side. 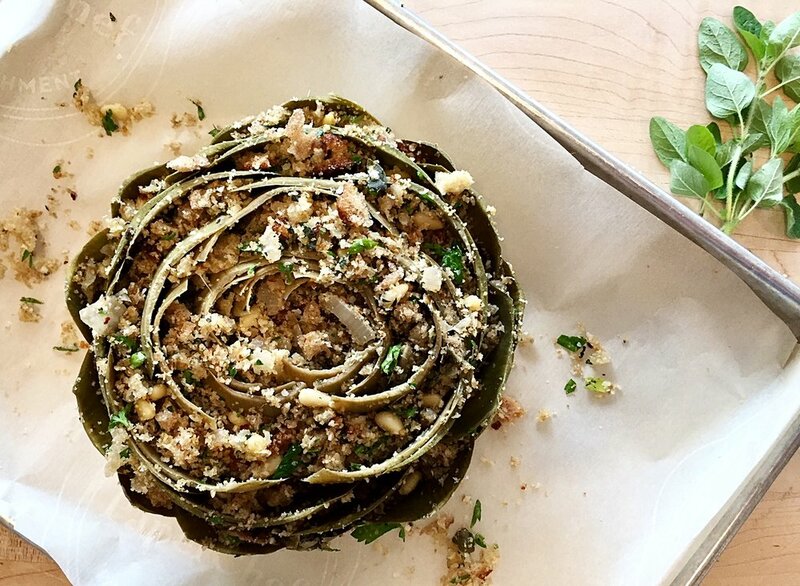 Anchovy & Pine Nut Stuffed Artichokes ~ Serves 4 to 6 ~ This is a lighter version and makes a great appetizer using artichokes that are on the small to medium size. The anchovies melt into the stuffing creating umami flavors perfect with artichokes. Follow cooking instructions above for the artichokes and the breadcrumbs. In a sauté pan over medium heat, add two tablespoons of olive oil and sauté the onion until tender. Mince the garlic and anchovies together to form a rough paste and add to the onions. Sauté until the garlic is tender and the anchovies have “melted” into the mixture. Add the mixture to a medium bowl along with the bread crumbs, pine nuts and capers, herbs, chili flakes and cheese and toss just to blend. Season to taste with salt and pepper. Lightly fill the artichoke center with filling as well as in-between the leaves. Place the artichokes in a baking dish that has just enough room to hold them snuggly. Drizzle with remaining two tablespoons of olive oil and the 1 cup of broth, water, or wine. Serve with lemon wedges or lemon butter.